Ansonia " La Nord" Royal Bonn China Clock , circa 1900 Perfect condition. No chips, no repairs, no cracks. Case: Royal Bonn China. Made in Bonn, Germany for Ansonia. 11.25" high with 5" dial Works: Ansonia open escapement 8 day brass movement with strike on gong. Ansonia Clock Co. was in New York City, (Brooklyn) and was one of the most successful manufacturers of clocks in the late 1800\'s until the mid 20th century. 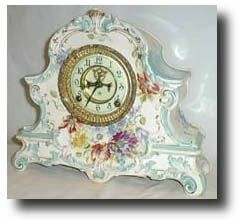 Reference: Ansonia Clocks by Tran Duy Ly Condition: Case - Excellent, no cracks or chips; Works - Excellent.